Born and raised in the San Francisco Bay Area, Jaime Robles is a writer and visual artist. She has produced many of her texts as artist books, including Loup d’Oulipo (Woodland Editions, 2002) and Letters from Overseas (Woodland Editions, 2010), and her books are in collections at the Bancroft Library, University of California, Berkeley; the Beinecke Library, Yale University; and the Oulipo Archive in Paris, among others. 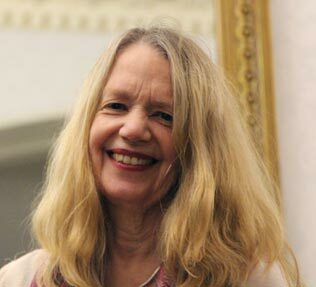 While living in the UK, she created several poetry installations, including Autumn Leaving, Wall of Miracles and The Wittgenstein Vector; the latter two with the poetry collective Exegesis, British poet-philosopher Mike Rose-Steel and Canadian poet SMSteele. Her most recent creative piece is a short film mixing imagery with three poems written in response to Wittgenstein’s Tractatus. She holds a doctorate in Creative Writing from the University of Exeter, UK. She has two poetry collections from Shearsman Books in the UK, Anime Animus Anima (2010) and Hoard (2013), and a chapbook-length poem, Memory Palace, from The Lune (2017). Since 1995 she has been writing libretti. Beginning with readings with improvisational accompaniment, she moved into formal lyrics, working first with composer and instrumentalist Peter Josheff. She currently works with composer Ann Callaway. Their first project, Vladimir in Butterfly Country, was performed as part of the Sonic Harvest in 2012 and at the Old First Concert Series in San Francisco in 2013. They are working on a companion chamber opera titled Spirit of the Moth. The video of Three Propositions is here on YouTube.